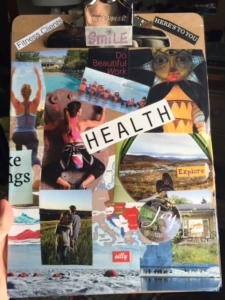 My vision board…front and back. 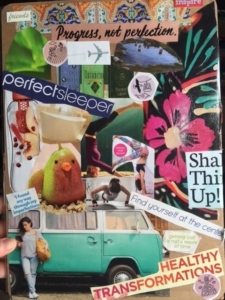 Stephanie Tishler of Tishler Coaching Services hosted a Vision Board Party. Full disclosure: Steph has been a client and friend for years, which is the reason I went. I’m not anti-vision board per se, but it’s not something I would normally seek out on my own. I didn’t know if I was going to know anyone else at the event (turns out I did), but I was a little concerned about creating a vision board with a group of people I didn’t know that well. It seems sort of personal. I had nothing to worry about. The entire night was great—better than I expected. In fact, I’m writing this post because I think it’s a great way for a group of friends, co-workers, or interesting strangers to spend a few hours together.